The title Our Lady of Loreto refers to the Holy House of Loreto, the house in which Mary was born, and where the Annunciation occurred, and to an ancient statue of Our Lady which is found there. Tradition says that a band of angels scooped up the little house from the Holy Land, and transported it first to Tersato, Dalmatia in 1291, then Recanati, Italy in 1294, and finally to Loreto, Italy where it has been for centuries. It was this flight that led to her patronage of people involved in aviation, and the long life of the house that has led to the patronage of builders, construction workers, etc. It is the first shrine of international renown dedicated to the Blessed Virgin, and has been known as a Marian center for centuries. Popes have always held the Shrine of Loreto in special esteem, and it is under their direct authority and protection. 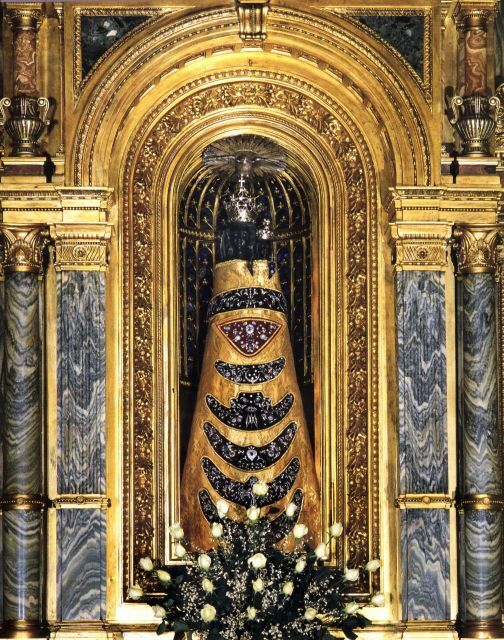 The reason why Our Lady Of Loreto statue is black according to religion is due to the fact that it is mentioned in the "Song of Songs" where it reads: "Brunette are, but beautiful." To reinforce this hypothesis is another phrase, always in the same song, which Mary says to her friends: "Do not look to me that I am brunette because I have sunburned me" (1, 5-6). The Sun, which is also God's figure, would be the origin of the phenomenon that characterizes not only the Madonna of Loreto, but also that of Czestochowa, which are women of white race but of black leather. When the walls of the Holy House were transported from Nazareth to Loreto, the faithful initially worshiped a painted icon on the table: it was a sweet and beautiful painting with a little black face. Some scholars have found that many sacred images in the past became dark and sometimes unrecognizable for cigar and lamp smoke so much that it was often necessary to redraw them. Most likely the same fate happened to the beautiful icon of the Holy House. At the beginning of the sixteenth century the icon was replaced by a softly painted wooden spruce statue. Later on, the oil lamps that over the centuries illuminated the little house of the Holy House also blackened the outer marble of the sachets indefinitely. The smoke that the wooden statue of the Our Lady of Loreto (carved from Cedar of Lebanon) absorbed over the centuries has given it a very dark tint. In addition, despite the fact that the statue was destroyed in the 1921 fire and was rebuilt in 1922, on the Quattrini model, by L. Celani, it was made of Lebanon cedar wood painted uniformly and with a still black tone Darker than the previous one. Still today as tradition is done in 1924, on December 10, remembering the arrival of Santa Casa in Loreto, the fires are lit over the night to remember that happening.